Exciting announcement!!! 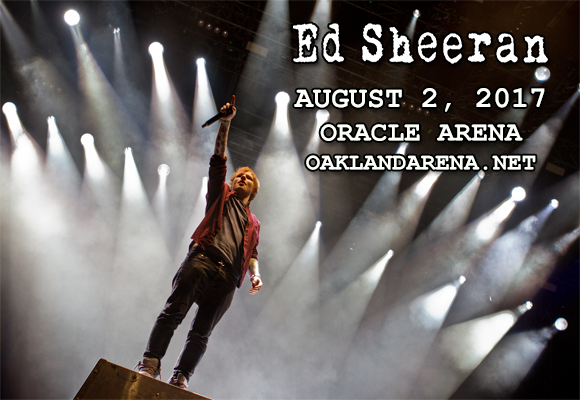 World-famous singer-songwriter Ed Sheeran is coming to Oracle Arena on Wednesday 2nd August 2017! The Grammy Award-winning troubadour will be playing songs from his brand new album, as well as solid gold hits like "Thinking Out Loud", so sure to book your tickets ASAP, as they are bound to sell out! Ed Sheeran is an English singer, songwriter and record producer. After years of playing open mic nights around London, Sheeran caught the attention of high profile artists such as Elton John and Jamie Foxx with the release of his 2011 independently released EP No. 5 Collaborations Project. He followed later that year with his seven-times platinum major label “+”, which earned him an Ivor Novello Award. Sheeran went on to win the 2015 Brit Award for Album of the Year, as well as the Ivor Novello Award for Songwriter of the Year with his second studio album, which launched the single “Thinking Out Loud”. “Thinking Out Loud” won Sheeran two Grammy Awards at the 2016 ceremony: Song of the Year and Best Pop Solo Performance. His third studio album was released in March 2017, debuting at number one in the UK, the US and other major markets, and launching two record-breaking singles: "Shape of You" and "Castle on the Hill", which debuted at number 1 and 2 in the UK, Australia and Germany. This year, Sheeran became the first artist to have two songs debut in the US top 10 in the same week.